With all the news this past week about Pluto, most skywatchers aren’t aware that Ceres, the brightest and nearest of the dwarf planets, will be coming into opposition to the sun on Saturday morning, July 25. An object is said to be in opposition when it is directly opposite the sun in Earth’s sky. When an object is in opposition, it rises at sunset, is visible all night, and then sets at sunrise. When Ceres was discovered by Giuseppe Piazzi on the first day of the 19th century, January 1, 1801, it was initially thought to be a planet. Other objects were soon discovered in the gap between the orbits of Mars and Jupiter, so a new name was proposed for these tiny bodies, “asteroids.” This was because of their resemblance to stars in the telescopes of the day. When the International Astronomical Union proposed a new category, “dwarf planet,” in 2006, Ceres was included, along with Pluto, Eris, Haumea, and Makemake. So tiny Ceres has been called three different things in the 214 years since it was discovered: planet, asteroid, and now dwarf planet. Despite its recent designation as a dwarf planet, Ceres is still considered to be an asteroid by most astronomers. As such, it is the largest of the asteroids at 592 miles (952 km) in diameter, almost twice the diameter and four times the mass of the next largest asteroids, Pallas and Vesta. On the other hand, it is far smaller than any of the other designated dwarf planets. It is also smaller than fifteen of the moons in the solar system, including Earth’s moon. 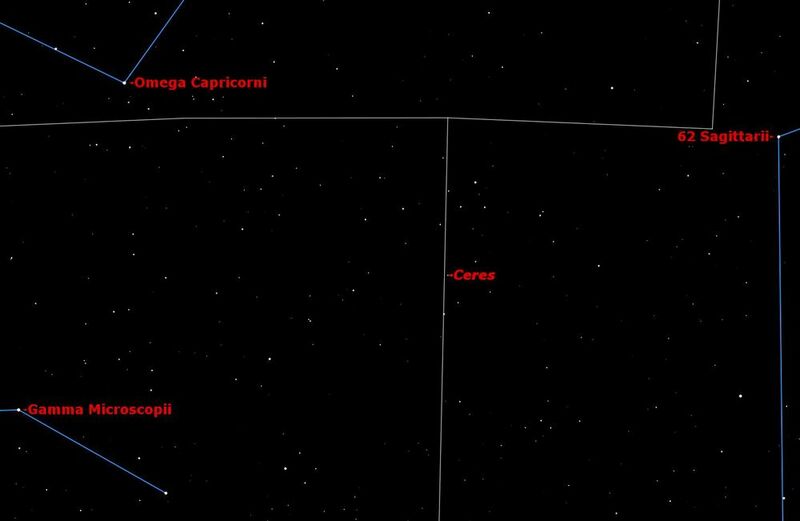 This year, Ceres reaches opposition just on the Sagittarius side of the border between Sagittarius and the little-known constellation Microscopium. It is most easily found by looking within the triangle formed three 4th magnitude stars: 62 Sagittarii, the easternmost star in Sagittarius, Omega Capricorni, the southernmost star in Capricornus, and Gamma Microscopii, the brightest star in the dim constellation Microscopium, the Microscope. 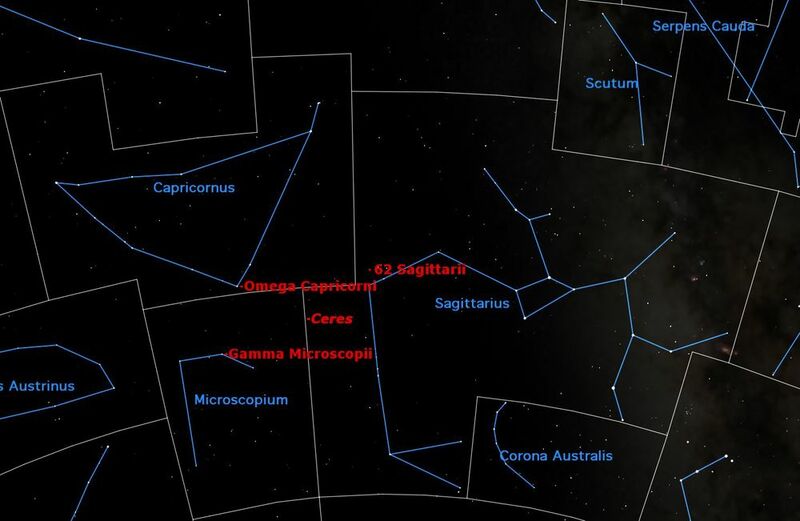 On Saturday morning, July 25, the dwarf planet Ceres will be in opposition to the sun on the border between Sagittarius and Microscopium. Credit: Starry Night software. Because of its faintness, magnitude 7.5 at opposition, detailed charts are needed to distinguish Ceres from the stars it’s passing in front of. Our chart shows its position on the morning of opposition, Saturday, July 25. If you try to find it on any other night, you will need to plot its position with a program like Starry Night or SkySafari. A detailed chart for locating 7th magnitude Ceres on July 25. Credit: Starry Night software. As seen in even the largest telescopes on Earth, Ceres appears as a point of light, no different than the background stars. The only way to be sure you have seen it is to plot its position and then try to observe the same area on another night. On March 6 this year, the Dawn spacecraft entered orbit around Ceres, and has since been returning detailed images of Ceres’ surface. Thus, 2015 marks a special year for the exploration of the solar system, with Dawn orbiting Ceres and New Horizons flying close to Pluto.